Gaia's first data release was not designed to be a full database with which major scientific discoveries could be made. Instead it was foreseen much more as a set of test data that astronomers could practice on and get ready for the second release from ESA's billion-star surveyor – the one that would feature a billion parallaxes and proper motions of stars. Gaia's first sky map, annotated. Credit: ESA/Gaia/DPAC. However, a great many discoveries have been made and published in the year and a half between the first release, published in September 2016, and the second one, planned for 25 April 2018. These results demonstrate just how powerful Gaia's data already is, and how extraordinary its major data release is going to be. The first release included celestial positions of 1.1 billion stars, the parallax (a measure of stellar distance) and proper motion for a subset of two million, plus additional information on 3000 variable stars and 2000 distant quasars. Based on this dataset, Gaia's first, unexpected results are already influencing how we think about cosmic environments near and far. From the closest neighbourhood of our Sun to the very farthest reaches of the Universe, Gaia is making astronomers’ dreams come true. Starting close by, Coryn Bailer-Jones found 16 stars in the catalogue that will pass within about 6.5 light years of our Solar System in the near future – on astronomical timescales. The closest encounter is confirmed for Gliese 710, a red dwarf star that astronomers had already identified as coming relatively close to the Sun in about 1.3 million years’ time. The gravitational perturbations from these close passages could affect the Oort cloud, the large reservoir of primordial comets orbiting in the cold, dark outskirts of the Solar System. This could push some of these objects into the inner Solar System in the form of comet showers, where they could potentially impact the Earth or other planets. Ralf-Dieter Scholz and colleagues also looked for nearby stars, but in their case white dwarfs and not red dwarfs. White dwarfs are deceased stars, stellar remnants that were once stars like the Sun. They found three new candidates within 80 light years of Earth, almost doubling the number of known white dwarfs in the Sun’s vicinity and proving the viability of their search process, ready for Gaia’s second data release. Instead of looking for nearby stars, Tommaso Marchetti and colleagues trained an artificial intelligence neural network to search for extremely fast moving stars. These so-called hypervelocity stars originated in the disc or centre of the Galaxy and have been flung outwards by near collisions with other celestial objects. This might have included an encounter with the supermassive black hole that resides in the centre of the Milky Way. Many of the stars are now travelling so fast that they will never return to the central regions of the Milky Way. Instead, they will be lost into the depths of intergalactic space. The neural network found 80 candidates in Gaia’s first data set, which the team further investigated using other telescopes, confirming that at least six candidates can be indeed traced back to the Galactic Centre. It is not just the fast moving stars that interest astronomers. Studying the velocity distribution of stars in the solar neighbourhood has shown that there are many kinematic structures. These are groups of stars that are not necessarily located close to each other in space but are moving with similar speeds in similar directions. There are several possibilities to why different stars have similar kinematic properties: they could derive from ancient open clusters that have by now dissolved; they could be due to dynamical resonances within the Milky Way; or they could even be remnants of accreted satellite galaxies that merged with the Milky Way billions of years ago. Iryna Kushniruk and colleagues found 19 kinematic structures in the first Gaia data release, three of them completely unknown before. The second release promises to reveal these structures in much greater detail, and perhaps uncover others. Looking outside the Galaxy, Gaia has started to redraw the map of our immediate galactic neighbours. Vasily Belokurov and colleagues used the data to trace a beautiful bridge of variable stars between the Large and the Small Magellanic Clouds, two satellite galaxies of the Milky Way. This shows that these systems are not completely separate. The astronomers did this work in a creative way. They looked at the estimated errors in the brightness measurements of the Gaia data, and realised that those with the largest errors must be pulsating variable stars. This is because the variable stars change their brightness significantly and so generate the largest 'errors' away from their average brightness. Gaia's first data have also been used to investigate another nearby galaxy, known as the Sculptor Dwarf Galaxy. Using measurements from DR1 and the Hubble Space Telescope, Davide Massari and colleagues showed that this dwarf galaxy moves around the Milky Way on a highly inclined, elongated orbit that takes it much further out than previously thought. By tracing the motion of the stars inside the galaxy, they were also able to estimate the distribution of invisible dark matter that is needed to make the stars move as observed. Being able to see the motion of individual stars in another galaxy marks the beginning of a new era for astronomers. 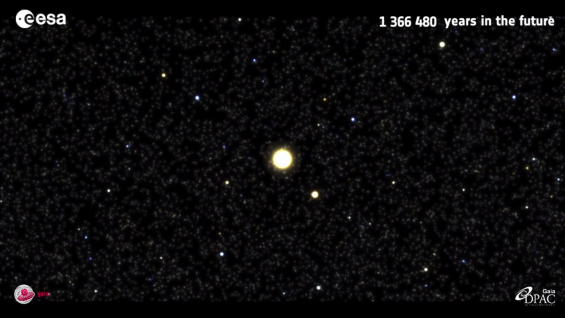 The most distant objects observed by Gaia are the quasars. These are galaxies with intensely bright cores. The power of a quasar comes from exceptionally hot matter falling into a central, supermassive black hole, through a structure known as an accretion disc. Using data from the first release, Fernanda Ostrovski and colleagues discovered a quasar that has been gravitationally lensed by an intervening galaxy. Such alignments allow astronomers to map the structure of the intervening galaxy and probe the physical properties of quasar accretion discs. They can also be used to constrain cosmological parameters such as the expansion rate of the Universe, the density of dark matter and dark energy. As impressive as these discoveries all are, they are just a taste of what is to come from the second Gaia data release.